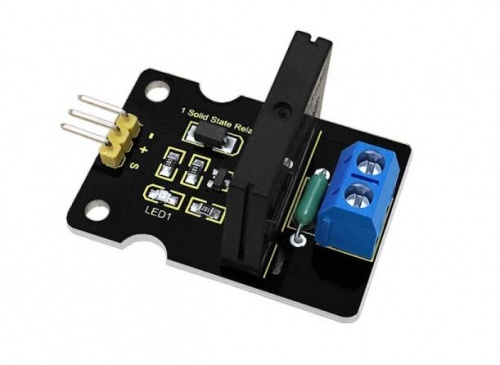 Keyestudio single solid state relay is a low level effective solid state relay, that is to say, the input control signals is the low level (0-1.5 V), the relay is on; while the input control signal is high level (3-5 V), the relay is off. 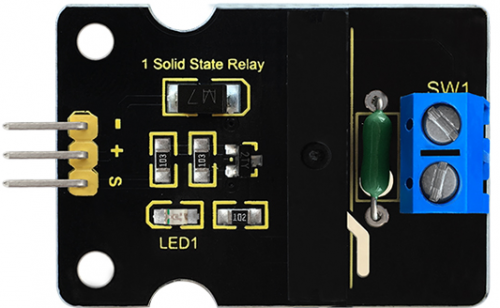 Solid State Relay is a new kind of contactless switching device which is composed of all solid state electronic components. Compared with the electromagnetic relay, its reliability is more higher, with the features of non-contact, long service life, fast and less outside interference. 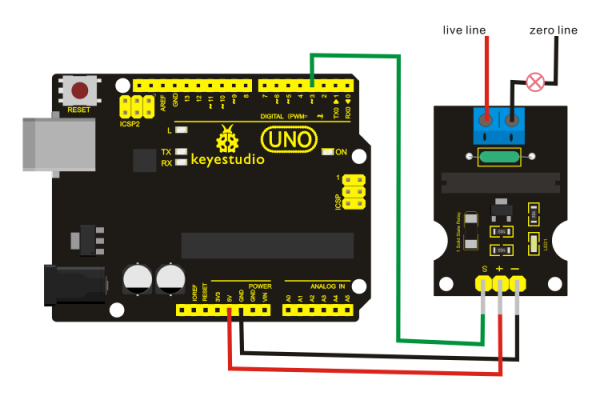 The output control terminal of the keyestudio single solid-state relay must be connected to the circuit, and its working current needs to be bigger than 50mA, so that the solid state relay can be disconnected normally. Wiring as the above image, after powered-on, the solid state relay breaks for 1S and then connects for 1S, cycling alternately. This page was last edited on 19 April 2019, at 11:17.